Luigi Ferraro (1914 – 2006). A Second World War hero, decorated with a Gold Medal for Military Valour, the highest Italian military decoration, he dedicated his entire civilian life (from 1945 until his death in 2006) to the development of underwater activities for which he is considered a pioneer. 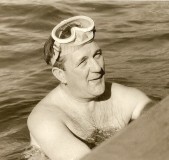 His name will also be remembered as the inventor of modern fins and scuba masks as we know them today. This website is a tribute to his memory. The intention is not to provide a complete biography, but to underline some of the key episodes of his life that will give readers the opportunity to become acquainted with and appreciate his character. NOTE: The number (1) at the end of the text indicates that it has been extracted or summarised from the book “Luigi Ferraro: un italiano” by Gaetano Ninì Cafiero – Ireco Editions – Formello. The number (2) indicates that it has been extracted or summarised from the book “Dominare gli istinti” by Gaetano Ninì Cafiero – Ireco Editions – Formello. The number (3) indicates that it has been extracted or summarised from the book “Una fiamma negli abissi” by Gaetano Ninì Cafiero – Ireco Editions – Formello. We thank the Editor for this opportunity.